Winter time means skiing, glistening snow and bright sunshine on the best slopes of winter sports. But what would be winter holidays without the so called "Einkehren", the visit of one of the numerous lodges? Whether mulled wine, the fresh draught beer, soem Schnaps, or one of the many traditional cottage dishes - skiing holidays has for all the fans something unique to offer. To have some of the delights at home as well, you don't have to wrap them up. Classically served in a pan, this form of serving invites it to be a shared around the table with a fork for each to fetch the flair of the ski hut in the apartment. Although the typical Kasnocken-Spätzle can be bought, it is more fun to make them yourself, especially when several people help cooking. 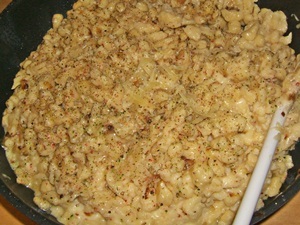 Spätzle can be prepared the day before, then there will be more time to entertain the guests. 25% beer cheese ("geschmackiger" type of cheese with low fat, which is characterised by a very strong smell and taste. Austrian beer cheese is cheese made of cow milk with Brevibacterium linens, its surfaced is rubbed with beer several times; the same bacteria is used for Limburger and Romadur). Beer cheese can be substituted by a mountain cheese, or cheese from raw milk. For the spaetzle we mix flour, eggs, water and 1 tea spoon of salt in a bowl. Mix the dough with a mixer with a dough hook, or classically with one hand (a hand holding the bowl, another one mixing the dough) 'beaten' to smooth dough. Let it rest for 20 minutes to allow the gluten in the flour set in motion - that makes the dough tougher. Heat a large pot with water and add salt. Make the spaetzle with a spaetzle maker, like our easy to use spaetzle plane Josef. If you do not have a spaetzle maker, put the dough on a breakfast-board, cut it with a knife and let it drop into the water. It should be large, thick and short mini-miniature dumplings. If the total mass is in the water, let it boil once, stir it carefully, so that Spätzle do not stick together. Leave it shortly in the pot. But the Spaetzle out of the pot into a second bowl with cold water, then drain through a sieve and ensure that these are cold. Cut the cheese, either in the machine, or by hand with a carrot grater or just cut finely. Fully heat the oven to a full turn. Kasnocken are classically prepared in a large pan, in which they are also served. Basically, all kinds of pans can be used. Most of these pans have a plastic handle and are not suitable for the oven. To be later eaten from the pan better not use a coated pan, as coating will be scratched with metal forks. Cut onions, heat the pan with 5 tablespoons of oil. Add onions and a little salt. When the onion is slightly fried, put away from the oven. Put the cheese on the spaetzle and put it into the oven until it melts. The different ingredients will not be mixed now! Attention, if the pan has a plastic handle: leave the door open and position the pan so that the handel is on the outside. When the cheese is melted properly, take out the pan, add salt and pepper, and mix all the contents, so that cheese, onion and Nocken are evenly distributed, and all the cheese are covering the Nocken. Put it in the oven for the second time in, now in the upper half so that the Kasnocken get a light brown crust. Cover with roasted onions and serve with a green salad. 1) Can I really use any cheese for Kasnocken? Practically, yes. If you only use Parmesan, give it a try and add a half-liter sauce Bolognese. That has nothing in common with Kasnocken, but also tastes greatly. 2) Unfortunately, the door of the oven closed, and not only the cheese, but also the handle of my Teflon pan is melted. Can I still eat the dish? No. Away with it. Even if you see some shiny aluminum through the coating, the pan is ready for the special waste. 3) Half of my guests could not come. Can I use the remaining Kasnocken for something else? Put the remaining Kasnocken into the freezer, on the next day, cut into small cubes and serve in hot soup. 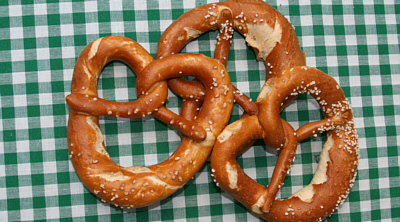 4) Unfortunately, I did not have any Kasnocken yet, but want to give the recipe a try. In the supermarket, there are Swabian Spätzle to buy. Can I use them for Kasnocken? No. Schwäbische Spätzle are nice too, but it fits better as a supplement to meat or bacon and egg. With that there would perhaps be a new dish, but the mountain cabin look and feel would not be the same.